I have always loved the all white look but was never really sure how I wanted to pull it off. When I was looking for inspiration for this week’s Hollywood to Housewife I stumbled on a picture of Alexa Chung sporting white overalls and a white shirt. I loved the look of it paired with a trench coat and cognac shoes. I knew I didn’t have overalls, and didn’t want to purchase any. I knew I probably wouldn’t wear them that much so it totally wouldn’t be worth it. 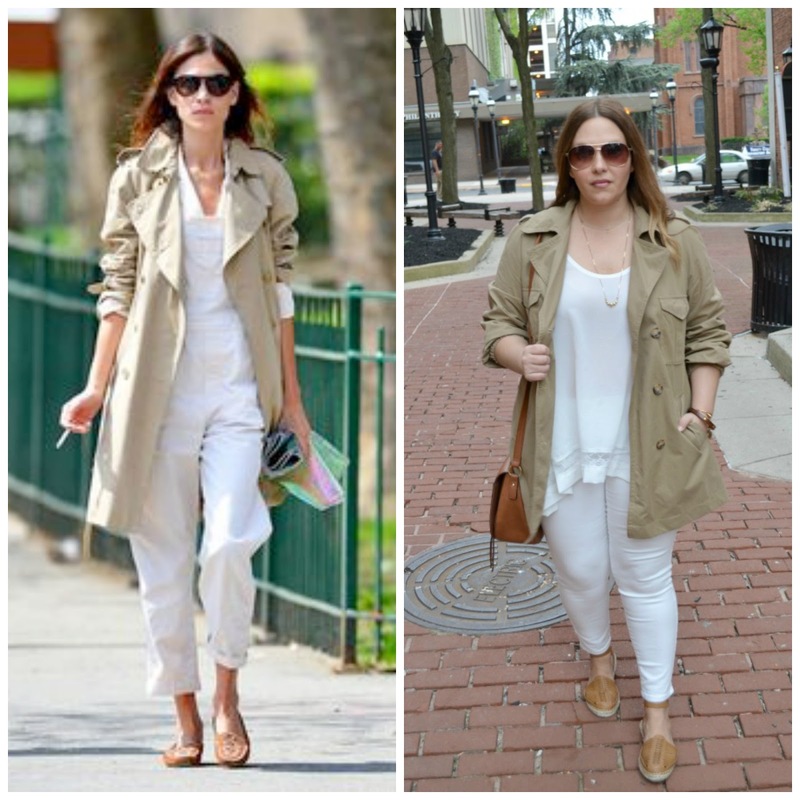 With no overalls, I grabbed my white jeans, current fave white top, trench coat and cognac espadrilles and hit the pavement (sans cigarette she has, of course)! White jeans can be tough sometimes. While it is such a basic color, I personally have a hard time pairing them with the kinds of tops I would wear with a basic pair of jeans. I don’t think I will ever refer to white jeans as my “go-to” but it is a nice change from you basic blue jeans. Because I feel like white jeans show everything I prefer to wear them with longer, and if possible, flowier tops. I just feel more comfortable that way! I will say though, I do enjoy the head to toe white…there is a chance I may rock this look again! Hi! Where did you get the bangle and sunglasses from? Theyre great!